The Bear Crawler Tour takes approximately 1 hour. The Waterfall Canopy Zipline Tour takes approximately 2 hours. The Foxfire Mountain Adventure Park is filled with a variety of fun that the entire family can enjoy. One of the best parts of the park is the Bear Crawler Tour, which gets participants out of their element for an exciting off-road ATV adventure. This extreme excursion is great for families of all ages, suitable for guests three and up. So bring along the whole crew for an unforgettable off-road experience through the beautiful Foxfire Mountain area. 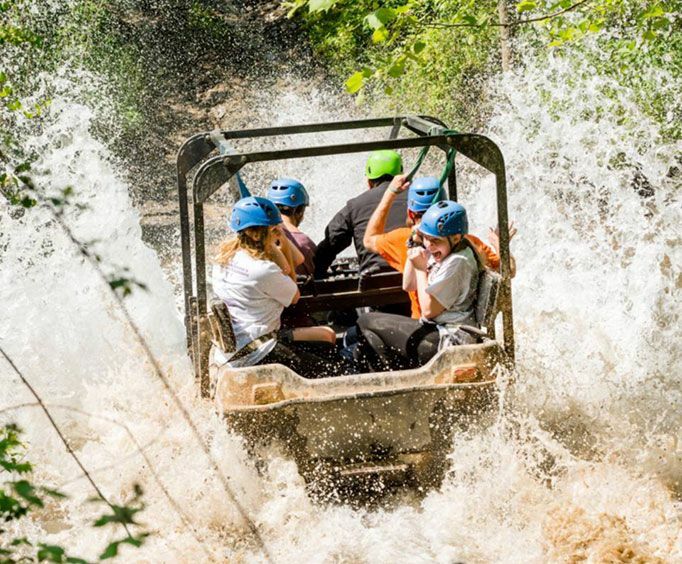 Guests will climb aboard an open-air 8-Wheel-Drive ATV where they'll truly conquer the mountain! Imagine zooming through beautiful forests, splashing through water and splattering mud on a thrilling adventure. The wind rushing and your heart pounding as you make the journey up to the top of the mountain. Guests will be able to see some stunning views of the Great Smoky Mountain area and hear the story and history of Foxfire Mountain during this excursion. This tour can also be combined with the Waterfall Canopy Zipline Tour for even more heart-pounding thrills. On the canopy zipline, guests will zip through the treetops on a two-hour trip featuring waterfalls, valleys, and more with seven different ziplines and two sky bridges. 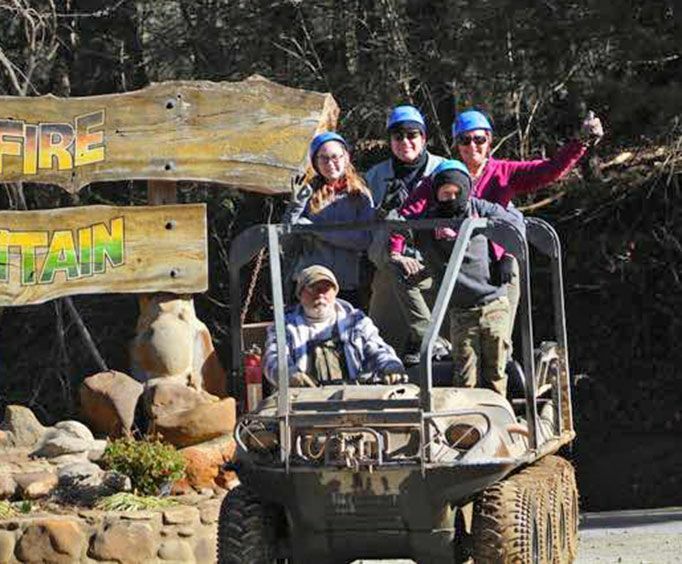 Do not miss out on all the adrenaline-pumping action that makes up the most thrilling parts of Foxfire Mountain Adventure Park. With the Bear Crawler ATV Off-Road Adventure, guests can experience tons of fun. What is included in the admission price for Foxfire Mountain Adventure Park Bear Crawler Off Road ATV Tour ? Includes the Bear Crawler ATV Tour. All abilities are able to enjoy this tour. Is Foxfire Mountain Adventure Park Bear Crawler Off Road ATV Tour guided or a non-guided timed equipment rental? 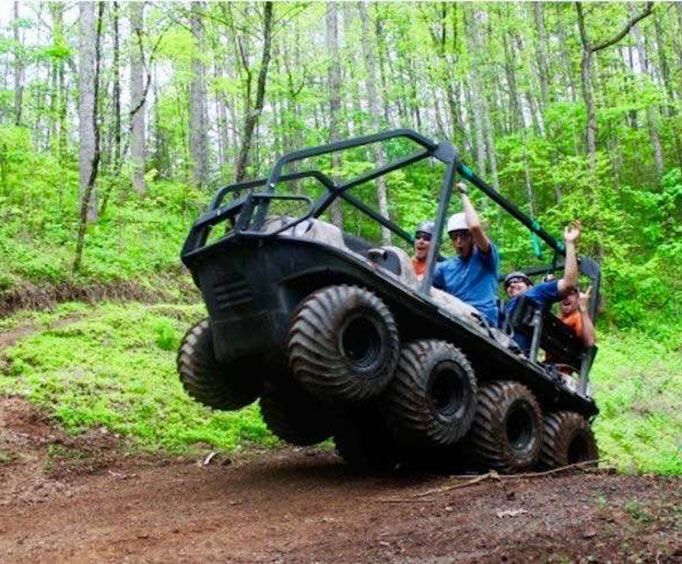 What age is Foxfire Mountain Adventure Park Bear Crawler Off Road ATV Tour appropriate for? Children must be at least 3 years old and be able to sit by themselves.